JUPITER, Fla. – Harbourside Place is a gilded and shiny new development here, built by a transplanted New Yorker named Nicholas A. Mastroianni II. It is a testament to the good life. There’s a marina, a Tommy Bahama shop, a Wyndham Grand Hotel. Under construction is an 8,000-square-foot restaurant called The Woods Jupiter: Sports and Dining Club. The Tiger Woods you know and love might not be at Doral this week, but do not fear: He has other things to keep him busy, like his new restaurant, his first major and public entrepreneurial investment. Unlike his role in the energy-drink start-up Fuse Science, where he had a stake in a company that crashed, this is a business he can control. Woods lives a few miles from his latest venture and the other day shop workers and shoppers were amazed to see a shiny Ferrari crawling along Harbourside’s main drag, with not one but two iconic athletes in it. “Lindsey?” the developer said, referencing the skier Lindsey Vonn. “Michael Jordan,” he was told. In other words, Harbourside is more than a testament to the good life. It is a tribute to success and what it can buy. It represents that which is best. Medalist Golf Club, 10 or so miles up the road, where Woods is a member and often plays, has a similar underpinning. Greg Norman was a founder of the club in 1995, near the end of his run as the game’s dominant player and personality. While the world’s best players were at Doral on Thursday, Woods, who didn’t qualify for the World Golf Championship event, was working on his game at Medalist with his swing coach Chris Como. If Woods follows his customary pattern, he’ll play later this month when the Tour goes to Orlando’s Bay Hill, which Arnold Palmer played a key role in developing. There comes a point for most iconic golfers when they become as interested, if not more interested, in their off-course business ventures as they are in their on-course business ventures. It was true for Palmer, for Norman, for Jack Nicklaus. Woods has said often that his children are now the highest priority in his life. The restaurant represents an investment where he can leave a deeply personal mark, as he can with the golf courses he is developing. Raising children, of course, is the ultimate example of that. After withdrawing from the Tour stop in San Diego last month, Woods went to see Vonn, his girlfriend. At 39, his priorities are naturally shifting. A press release last year said Woods’s restaurant expected to be open by the end of March. Construction delays are common in large-scale projects and the town of Jupiter has a reputation for being deliberate in the permitting process. Was Woods playing or practicing at home this week? Was Woods invited to the recent Ryder Cup press conference and if so why did he not attend? Is there an opening date for Woods’s restaurant? Pete Bevacqua, the CEO of the PGA of America, said that all 11 members of the Ryder Cup task force, of which Woods was a member, were invited to attend last week’s press conference in Palm Beach Gardens, about a 25-minute drive from Woods’s home. Woods, Jim Furyk and Steve Stricker did not attend the conference, citing scheduling conflicts. Mastroianni said the restaurant will have “a friends and family opening, a soft opening, probably late-April, mid-May. Then you have the summer to sort of work out the kinks and when the season begins, around Oct. 15, you’re ready to go.” He said the South Florida busy season for restaurants is mid-October to Mother’s Day. Mastroianni, who said he owns the hotel and 50,000 square feet of office space, added that Woods was his last tenant in and, after himself, his biggest one. According to the developer, Woods has a 10-year lease for the 8,000-square-foot restaurant and, across a skywalk, another 8,000 square feet of office space, where Mastroianni says Woods plans to move his ETW Corporation office, which is now in a nearby building that once housed Greg Norman’s business interests. “He’ll have his own private elevator,” Mastroianni said. It was not built for Woods; he will share it with Mastroianni. “His problem is that he gets mobbed wherever he goes,” Mastroianni said. “But he told me, ‘I want to use the front door [of his restaurant].’” In other words, he wants to see and be seen, a critical element in making celebrity-themed restaurants successful. Don Shula, Mickey Mantle, Sam Snead and other iconic athletes have all had restaurants named for them. Mastroianni said he has worked directly with Woods, with the CFO of ETW, Chris Hubman, and not at all with Mark Steinberg, Woods’s agent. He said Woods is spending $1,000 per square foot in the construction of the restaurant, about 30 percent more than most upscale restaurant owners spend. “He’s got marble from Italy, granite from another country,” he said. Mastroianni said he expected cocktails to cost about $15 each. He is aware of the power of the name. Mastroianni said that anytime he wants to use Woods’s name in a press release or anything similar he needs permission from Woods’s business people. “It’s over the top,” he said. 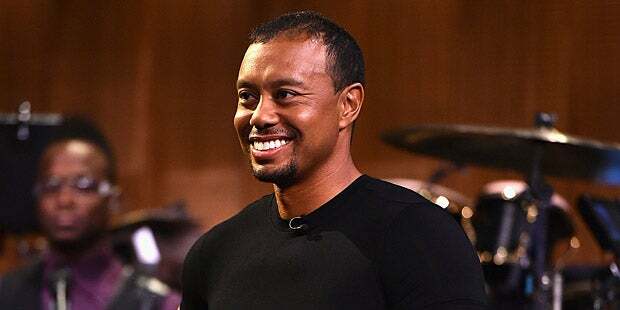 Mastroianni said he has not played golf with Woods but feels like he has spent “enough time with him to know him.” He was asked what the most memorable thing Woods has said to him. “’I like the way you roll,’” Mastroianni said, clearly proud of where his own business life has taken him.